Death may be a solemn affair in other parts of the country but in New Orleans and parts of South Louisiana, the dead live in cities, funerals include spirited parades and cemeteries are adorned on All Saints’ Day. The tradition of cleaning and decorating tombs on the Christian holiday that occurs every Nov. 1 harkens back centuries. Christians appointed the day after Halloween as All Saints’ Day to honor the departed Saints of the Catholic Church. Known as La Toussaint, a Catholic Holy Day of Obligation, South Louisiana residents would visit their deceased loved ones, white wash their tombs, weed the grounds and decorate their gravesites, sometimes with wax flowers. “…just like Ash Wednesday, the day after Halloween, All Saints’ Day, is the time to gather and reflect upon the meaning of life and death, of mortality and immortality and how quickly we pass from one to the other,” writes David Cheramie in Acadiana Profile magazine. Whether or not you have a loved one entombed in Louisiana, here are some unusual cemeteries to visit. At the Talbert-Pierson Cemetery near Pitkin and at the Istre Cemetery in Mermentau Cove, several graves rest within miniature houses, many of which include windows and locks on the doors. 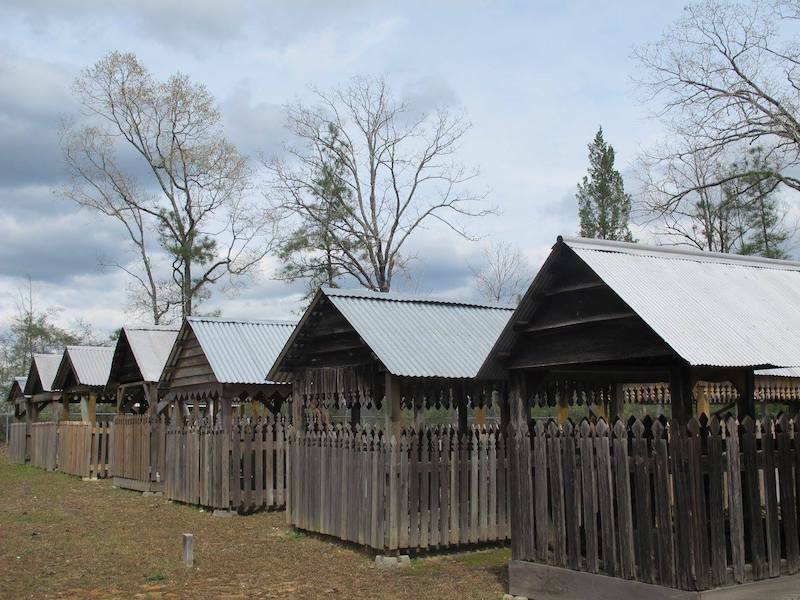 These little houses were constructed to protect the gravesites from the elements. The cypress houses at Istre Cemetery have been referred to as “Petite Maisons,” all about the size of a child’s playhouse. Istre Cemetery, dating back to 1886, is one of the last remaining examples of this unique custom in Cajun Country. In Rayne, the St. Joseph’s Catholic Church Cemetery is so unusual, it’s been mentioned in “Ripley’s Believe It or Not!” The graves are buried in a north-south direction instead of east to west, the traditional position so the departed will greet the rising sun, a symbol of Christ’s resurrection. And then, of course, there are the many cemeteries of New Orleans, all unique and full of legends, stories, heartbreak and creative architecture. A great way to learn more about the “Cities of the Dead” is to join a walking tour with Save Our Cemeteries, a non-profit working to preserve them. The organization will also host an All Saints Soirée on Nov. 9 at Metairie Cemetery. For more information on either, visit www.saveourcemeteries.org. Other ways to learn more is to pick up two wonderful books on the subject, “New Orleans Cemeteries: Life in the Cities of the Dead” by Robert Florence with photography by Mason Florence and “Elysium: A Gathering of Souls” by Sandra Russell Clark.